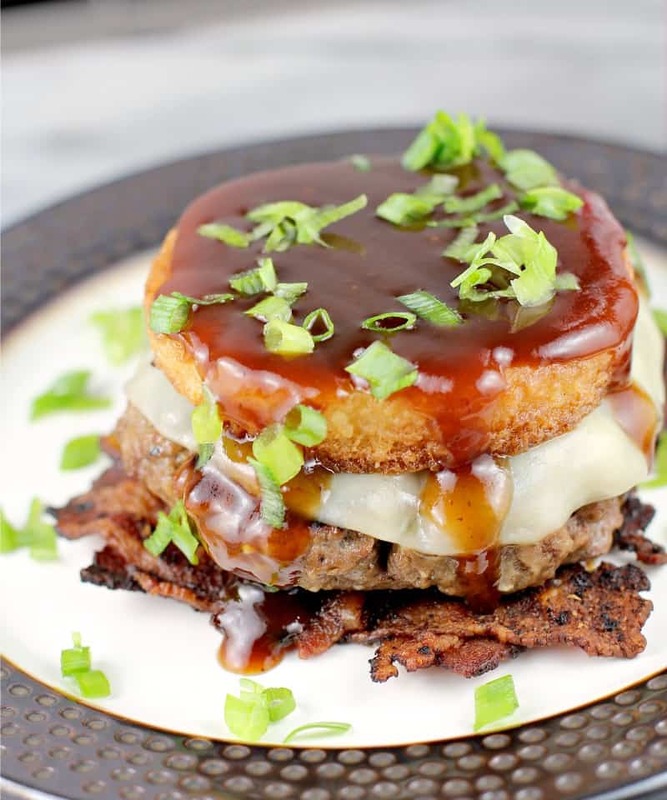 Low Country-inspired, BBQ Burger with Bacon Weave and Smoked Gouda Grit Cake. 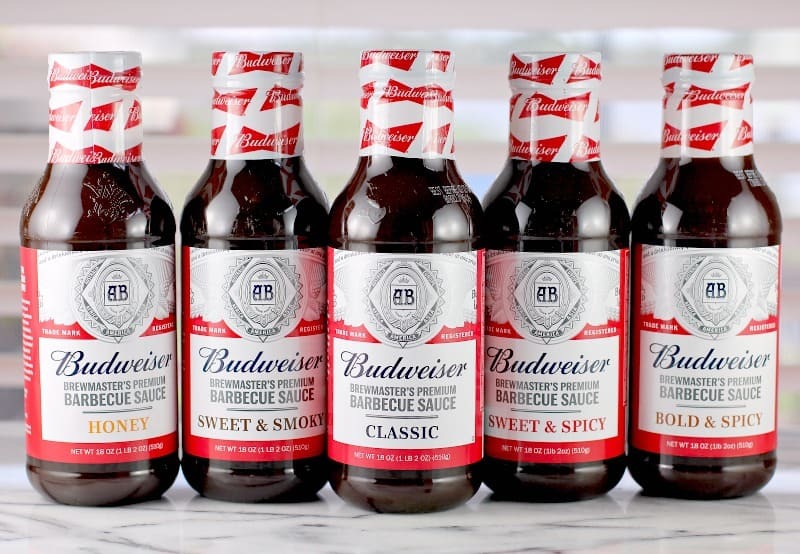 Crispy bacon lattice, a juicy burger, cheese, traditional grit cake, and Budweiser’s new Brewmaster’s Premium Classic Barbecue Sauce. 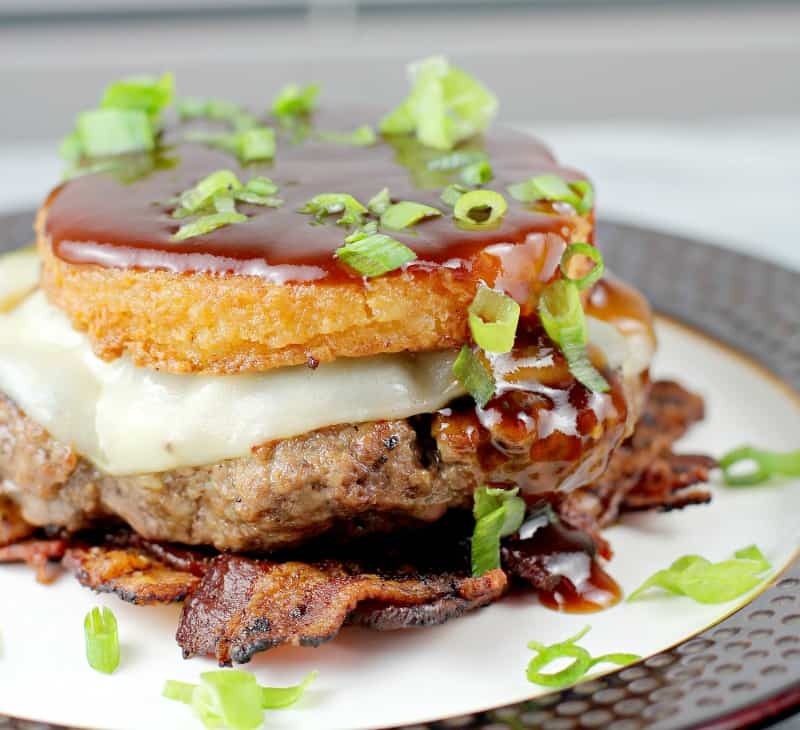 Forget the bun, load your burger up with bacon, cheese, sauce, and grits! Why so fancy? Because Budweiser sent me serious booty to make recipes for their contest … so here I am making recipes for their contest. If all goes well, I will put out a couple more this week too, but first, I wanted a BURGER. And I really wanted to do something completely different too. In a couple ways, this burger is inspired by the vacation we just took in Charleston, SC, last week. Gouda grits on a culinary tour in Charleston, and bacon “weaves” on sandwiches in Savannah. And so here we are… I put both with a burger. 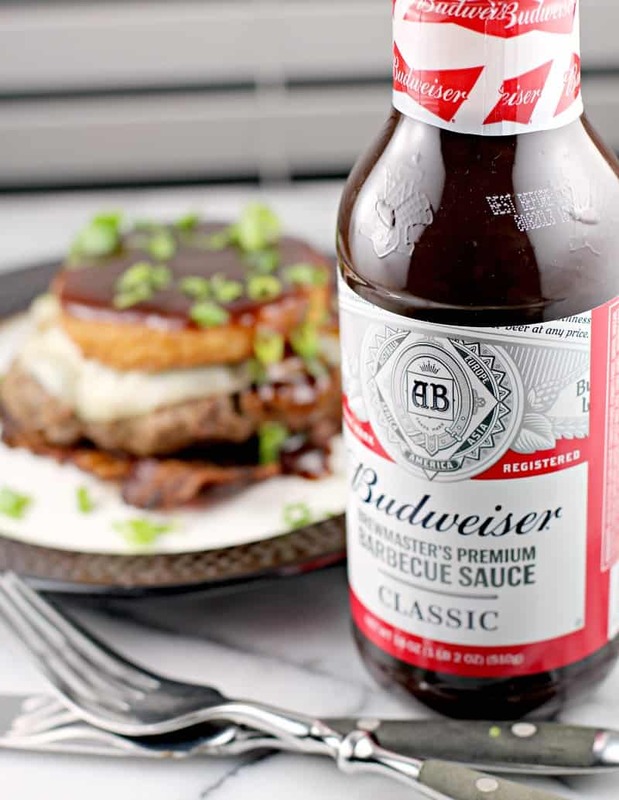 Since this is my first time with all these Budweiser sauces, I went with Classic Barbecue Sauce for this BBQ Burger with Bacon Weave and Smoked Gouda Grit Cake recipe for safety. Kinda like dipping my toe in the water, but not fully committing to bold or spicy or smoky yet. And it is GOOD! Not overly sweet as most sauces are. So, score one, good sauce. Score two is everything else, all together. Dangggg this is a good eat. 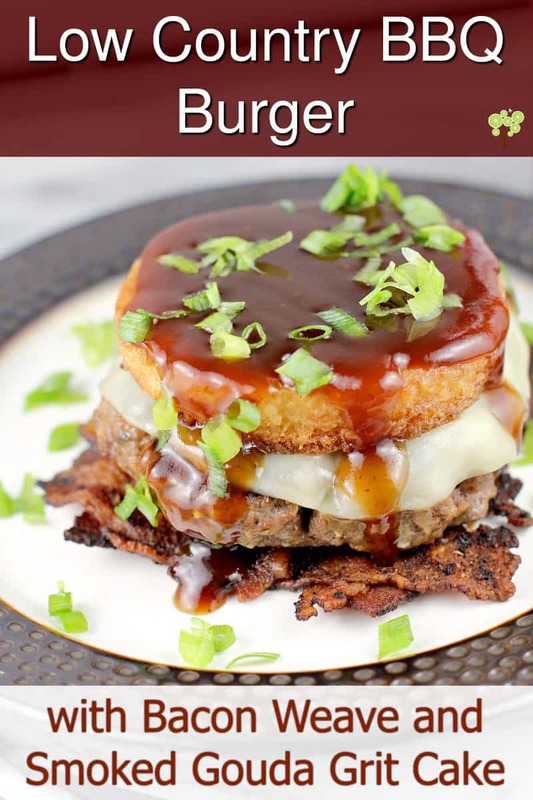 Everything works together – the bacon, burger, cheese, creamy/crispy grit cake, smoked Gouda flavor, barbecue sauce – It All Works. And I had so much fun making it! You know, we all start food blogging as a hobby because we enjoy it, but then as we go along, some times are not so fun anymore. I enjoyed making up this recipe, enjoyed seeing how each bit came out, and I spent a whole evening in my kitchen, rocking to jams, making this come together. So that’s it folks. 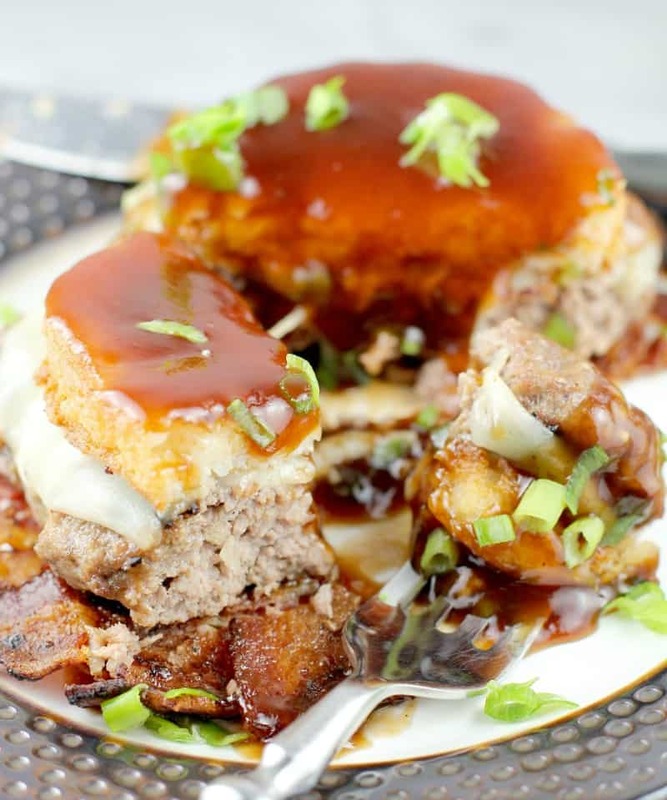 This Low Country BBQ Burger with Bacon Weave and Smoked Gouda Grit Cake recipe has a couple elements to make, but each is fully approachable and really straightforward. And the result is a fun, gourmet, hip, innovative burger that is DELICIOUS. Give it a whirl! Forget the bun, load your burger up with bacon, cheese, and grits! Bring the water and butter for the grits to a boil. Whisking constantly, stream in the grits. Reduce heat to medium and cook 5 minutes, whisking constantly. Remove from the heat, and stir in the cheese and salt. Taste for seasoning. Spread Gouda grits into a 13x9 bake dish, sprayed with cooking spray. Put dish in the refrigerator to cool completely and firm up (~30 minutes). Once set, use a 3-inch biscuit cutter to cut 6 rounds. Dust each with flour. Heat the vegetable oil in a large, nonstick pan. Add the cakes and gently brown both sides. Transfer to a plate lined with paper towels to drain. On a rimmed bake sheet, lay 3 bacon pieces (each is a half strip of bacon). 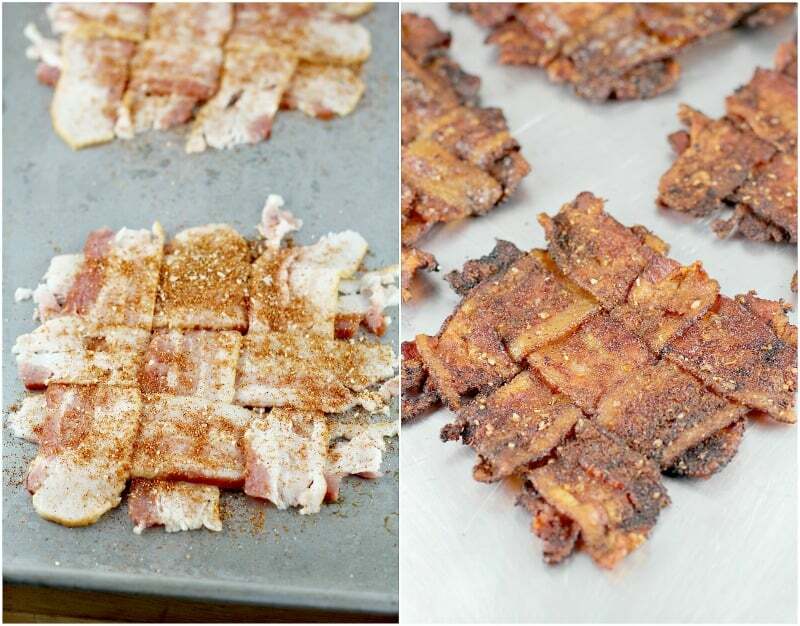 Use 3 additional pieces to weave the bacon and assemble a ~6x6-inch lattice. Repeat with the remaining bacon pieces to end up with six Bacon Weaves. Sprinkle barbecue seasoning over each. Bake at 400F for 15 minutes. Flip (by this point the lattice holds together so it flips easily), sprinkle more seasoning, and cook 10 minutes until fully crisp. Transfer to paper towels to drain fat and set aside. Combine the ingredients for the burgers and form into 6 patties. Put a dimple in each and spread each to keep them from balling up too much while cooking. 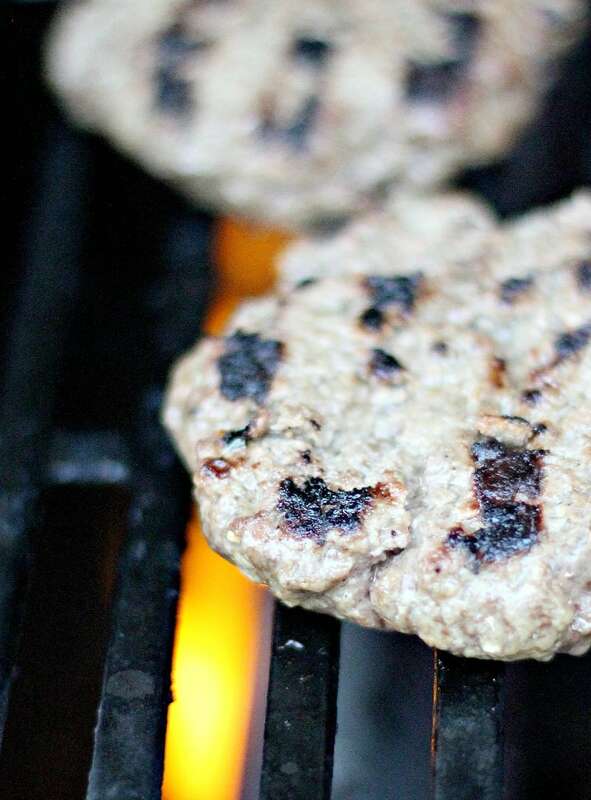 Grill burgers 4 minutes per side or to desired doneness. Place a slice of cheese on each and allow to melt. On a plate, layer in the following order: bacon weave, burger topped with cheese, and grit cake. Drizzle barbecue sauce over and garnish with green onion. Yields 6 servings. For seasoning the bacon, I wanted a candied vibe, so I used my Grill Rub because it includes brown sugar. You can use whatever seasoning you prefer, with brown sugar or not, or use no seasoning at all. It's bacon, it will be fine. 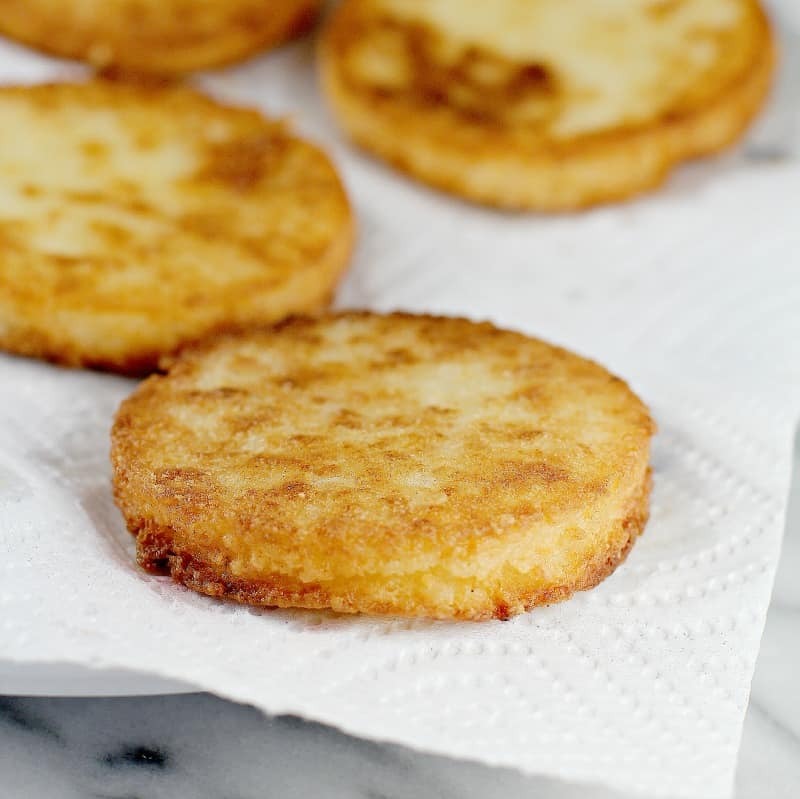 For the grit cakes, a large skillet will accommodate all 6 cakes; however, if you have to work in batches, replace the oil in between batches with fresh because the excess flour will blacken the oil, scorch, and cause subsequent batches to taste burned. For time management: cook the Bacon Weaves and prepare the burger patties while gits are setting. Cook the grit cakes while grill is heating. For more information on this new line of sauces, visit Budweiser. Also, follow on Facebook, Twitter, and Instagram. Oh my gosh you are making me hungry! We love BBQ and grilling so this might be one for our family to play with! YUM!! this looks delish. My son eats low carbs so I will be making this for him for sure. Plus I haven’t heard of this barbecue sauce before but now I want to try it. Wow, that looks amazing! I love barbecue, and this is a combination of so many of my favorite things! Did my husband commission you to make this recipe? Lol. You can bet I’ll be making this soon! That is a wild burger and I would love to try it! I wonder if I could make it keto? Oh yum, this looks and sounds delicious! I’ve been craving a good burger. I will definitely be trying this soon so thank you for sharing the recipe! That bacon weave looks awesome and so easy! Can’t wait to try next time! I had no idea Bud made a bbq sauce bet it tastes awesome! YUM! These look so delicious! I love the idea of the bacon weave – so pretty!!! Wow this looks so delicious, that bacon weave is genius! Wow, this looks absolutely incredible! Definitely going to have to give this a try! This look mouthwatering and just in time for Father’s Day ! What kind of miracle is this? BBQ and Budweiser together? I just found my perfect burger fix for later! cake. Woven bacon!?!? I’d eat this in a heartbeat! This looks so delicious! I would serve it in a restaurant!! I need to try make it! Oh my this looks delish! Is there anything better than a bbq burger though? This is definitely something I want to try. I hope you win because this looks fantastic, but I got to ask what are grits exactly? Sorry for the uneducated question, but is there a reason why it’s called low country? Or is it a term for a method of cooking?